Here some Ubuntu web design software, Cross-platform web development software, they run on Linux as well as on Mac OS and Windows. Brackets is a modern, cross-platform text editor that makes it easy to design in the browser supported by many extensions. Some popular extensions like Emmet, Beautify, File Icons, Indent Guides, Git integration for Brackets, Autoprefixer, W3C Validation will make your work easier. Atom is a cross-platform text editor that's modern, approachable, yet hackable to the core—a tool you can customize to do anything but also use productively without ever touching a config file. Supported by a lot packages make Atom do amazing things. 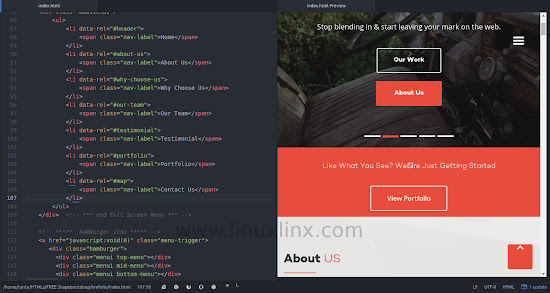 Bluefish is a powerful cross-platform editor targeted towards programmers and web developers, with many options to write websites, scripts and programming code. Bluefish supports many programming and markup languages. KompoZer is a complete Web Authoring System that combines web file management and easy-to-use WYSIWYG web page editing capabilities found in Microsoft FrontPage, Adobe DreamWeaver and other high end programs.KompoZer designed to be extremely easy to use, making it ideal for non-technical computer users who want to create an attractive professional-looking web site without needing to know HTML or web coding.